Family Handyman website shares how to install surface-mounted wiring and conduit for your home, barn or workshop on the homestead. Being a homesteader often times makes you a jack of all trades…. or at least that is how it feels sometimes, lol. 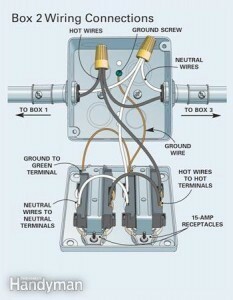 Wiring can be overwhelming for a first timer and it is helpful to learn beside a more experienced person if at all possible. If that is not possible, go slowly and follow directions carefully. The power of electricity should be respected at all times and safety precautions should be followed. I really like the Family Handyman website and magazine because it is creating people who are on the journey to becoming self sufficient. Family Handyman Whole House Repair Guide: Over 300 Step-by-Step Repairs! 101 Saturday Morning Projects: Organize – Decorate – RejuvenateNo Project over 4 hours!